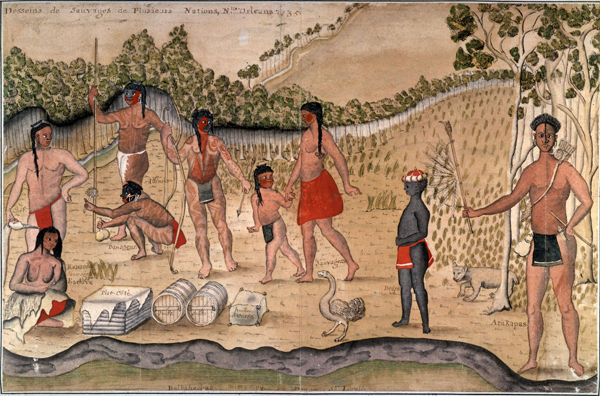 Alexandre de Batz created the earliest known images of Native Americans in the lower Mississippi valley from sketches he rendered while surveying Louisiana in the eighteenth century. 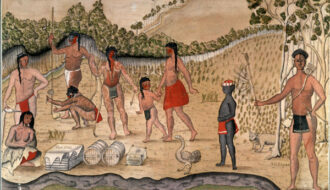 Signing the 1733 marriage register at St. Louis Cathedral as “Engineer to the King,” architect, draftsman, artist, and engineer Alexandre de Batz was already years into a process that is his greatest legacy: creating the earliest known views of Native Americans in the lower Mississippi Valley. Based on sketches rendered while surveying French colonial inventories and the Native-American villages existing just outside New Orleans, De Batz portrayed in watercolor Tunica Chief Bride les Bouefs, appearing in warpaint and holding scalps. His other Louisiana subjects, beyond the assignment to document New Orleans’ architecture, included the Colapissa, Choctaw, and Natchez tribes. De Batz was sent to Mobile in 1735 and returned to New Orleans in 1740 before being shipped to what French colonists called the Illinois Country (a region largely east of the Mississippi and north of the Ohio rivers) after the French decimation of Native Americans in the Beaver Wars. There he worked as an engineer and architect at Fort de Chartres. Staff of the Louisiana Endowment for the Humanities "Alexandre de Batz." In https://64parishes.org Encyclopedia of Louisiana, edited by David Johnson. Louisiana Endowment for the Humanities, 2010–. Article published September 12, 2012. https://64parishes.org/entry/alexandre-de-batz.